Every hunter, whether a firearm or bow shooter, novice or experienced, has experienced some difficult times tracking a wounded deer. From your stand it looked like a great shot, only to find little to no blood trail once on the ground. Other times you have a good blood trail to follow that seemingly disappears after a few hundred feet. Sometimes advanced hunters can draw on their prior experience and pick the trail back up, but too many of us it is not that obvious. I would rather try to do everything I could to recover that deer, rather than give up. This is where a blood light comes into play. This is a relatively inexpensive tool that can be the difference between recovering the deer or going home empty-handed, carrying the guilt of leaving a wounded deer to die in the woods. 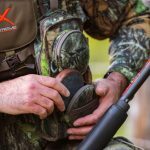 Primos Bloodhunter HD – Bright, powerful, and works. Our top-rated tracking light. Gerber Myth Blood Tracker – A good light for enhancing fresh, wet blood. Primos Bloodhunter HD Headlamp – A hands-free version of the popular Bloodhunter flashlight. Contrary to popular crime TV shows, blood does not magically appear when you turn on a UV light. Blood absorbs ultraviolet light and will appear black. You need to spray an area with a special chemical additive like Luminol for blood to fluoresce. The different colored LEDs create a contrast between the dried blood and the sticks and leaves on the ground. The lights also need to have a high output in order illuminate the ground around the blood trail. 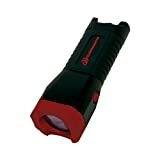 There are a lot of flashlights being peddled that claim to be “blood trackers”, but are nothing more than regular LED or UV flashlights which we already know won’t work. Here are your 3 best options for adding a blood light to your gear. The Bloodhunter is by far and away the highest rated blood tracking light available today. Primos gear can be hit or miss as a brand, but this light is on target. You should know the Bloodhunter HD is powered by lithium CR123 batteries. Even though CR123 cells are not as common and more expensive, they are more powerful than AA. A CR123 has a higher voltage (3.0V vs 1.5V) and larger capacity (1500mAh vs 700). Because of this, and CREE XM LEDs, this light has a very bright 600 Lumen output. The Bloodhunter HD uses a patented optical filter that dims leaves and brush while enhancing the visibility of blood. The flashlight has 2 modes, one high powered for tracking blood, and one low power for regular use. At 15 ounces, it is fairly heavy for a flashlight, but at least we know it’s well built. How well does it work? Judging by the dozens of positive reviews, it works extremely well. There are numerous stories about how the Bloodhunter HD helped hunters relocate a lost blood trail, and eventually to recover the animal. It’s a minimal investment that can pay off big time during hunting season. The Gerber Myth is a pretty decent alternative to the Bloodhunter HD. It puts out significantly fewer Lumens (33 vs 600), but it utilizes colored LEDs to create an optimal color spectrum that helps blood become more visible to the naked eye. It weighs less than half of the Primos, and is powered by the far more common AA batteries. If the thought of finding CR123 cells is annoying to you, then you would be better off with this light. The Gerber Myth definitely works at enhancing FRESH blood among the greens and browns of the forest floor, but because its light output is so much less than the Primos, it may take a little more work to learn to see the blood clearly. Aircraft grade aluminum for superior quality. The Bushnell TRKR is a regular LED flashlight that simply has three color options: White, Red, and Blue. The Red and Blue modes would be used for blood tracking in low light situations. Blue is best for finding blood against the greenish browns of woods. The White light is for regular flashlight illumination. The white light is very bright, 500 lumens, while the red and blue modes drop down to 15 and 6 lumens respectively. These colors don’t need the overpowering brightness to help you detect blood trails. Overall, this is an OK blood tracking light, but I would only buy it if I couldn’t get a Primos Bloodhunter HD or Gerber Myth. There are some other options if you go browsing online. Let’s take a look at those because I don’t want you to waste your money on a junk piece of gear. Protec 5906 Blood Tracker – This light is made by a brand I’ve never heard of, Protec, so it’s probably an imported flashlight. That said, it has some OK reviews and has the features you would want in a tracking light. You have 100 lumen white, and a 70-lumen green/red mode for seeing blood. The Protec is priced right, so if your budget is small, this one would be decent to give a try. Primos Bloodhunter HD Headlamp – I would rate this light as a solid “maybe”. It has the same technology as the flashlight version, but it’s much less powerful which limits its usefulness. If you hate lugging a flashlight around and prefer the convenience of a headlamp, then this one is your best bet. Primos Bloodhunter HD Pocket Light – This is one of those hit or miss Primos products I mentioned earlier. Why did they even make this product? It is sort of a halfhearted attempt at a smaller blood tracker. Not recommended. As you can see there are really only a few options for a good tracking light. For a decent, lower-priced option that runs on AA batteries, buy the Gerber Myth. But if you want the very best blood tracking light, look no further than the Primos Bloodhunter HD. It is bright, powerful, and highlights blood in low light better than any of the others.